It’s incredible how fast we’ve made the transition from the "old days" of lining up the old dead Elm tree with the pink cabin on the point, to today’s method of firing up the Global Map and pushing the "go to waypoint" button. In just a few years, the GPS has found its way into fishing boats, hunting packs and cars everywhere. Lost? Not any more, just type in the address you’re looking for and away you go. I’ve used mine to locate tree stands in the dark or to find that special fishing hole, I’ve avoided obstructions on "Rock Lake" and I’ve even found a gas station on an unfamiliar road. Today’s GPS units not only offer more features, but they’re smaller and more powerful than ever. Okay, so we all know how great these things are. But are we really getting everything out of our GPS that we can? Do we really use the features that our units offer? Or do we just hit the on button and hope for the best? Here are a few tips that will help turn your GPS into one of your most used and trusted outdoor tools. First things first, how accurate are they? Accuracy breaks down into two categories; the actual capability of the worldwide GPS system itself and the internal accuracy of the consumer models we purchase. In the early years, we heard about how the GPS system was intentionally de-tuned using what the US Government calls "Selective Availability" to prevent the consumer models from achieving the full potential of the GPS system. That all changed on May 1, 2000 when the GPS "Selective Availability" was de-activated or "turned off" by the President. Today, the system is available to all of us in a form that provides incredible precision. 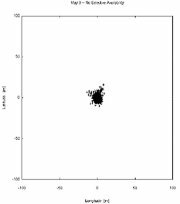 In fact, combining the satellite information with differential GPS (DGPS) corrections, accuracy can be measured in inches instead of feet. For sportsmen, this kind of accuracy is not really needed and would only serve to add to the cost of our units without producing any additional useful benefit. To get true "Centimeter Accuracy" would require a unit potentially costing tens of thousands of dollars. Above: GPS System accuracy before selective availability was turned off. Below: GPS System accuracy after selective availability was turned off. An important upgrade feature that does serve the accuracy needs for most of us is called the "Wide Angle Augmentation System" or (WAAS). This system combines upgraded Satellite calculations with a series of 25 ground stations spread throughout the US. Developed primarily to aid the aviation industry, this system is free to consumers and there are many affordable GPS models available that include WAAS capability. The extra accuracy is really nice, but not always necessary. For most of us using the GPS for fishing or hunting, we can get good results by just getting a basic unit that performs within the US Standard for "predictable accuracy" which is around 20 Meters. The term "predictable" means that you can count on this level of repeatable accuracy, but at times, your results can be much better. In fact, your unit will probably give you accuracy in the range of less than 5 Meters most of the time. Not all units provide the same features, power and options. You’ll need to take a decision about which features are most important to you, then select the GPS unit that best serves your needs. All of the major brands offer hand held and console GPS models as well as units that combine GPS with sonar and mapping features. In my boat, I want a full size, multi purpose console unit like the Lowrance X-15 that allows me to combine features, get multiple screen views and allows the use of after market mapping software all at the same time. I can now combine a nice big plotter screen, area map and sonar mapping features to give me a "one-look view" of everything I want. This is my normal set up for fishing. I keep the sonar and the map screens on at the same time. The map screen on the left is zoomed out to show the basic outline of the lake. Even though I could get anywhere I wanted to go easily with my hand held I-Finder model, the difference shows up in how much more effectively I can work fishing structures and access my information with the full size unit once I get there. I need a lot of information and lots of flexibility, so in my case the hand held serves as a great back up and really comes in handy at times when I want the convenience a portable, like when I’m hunting in the fall or Ice fishing in winter. Either way, when you first decide how you plan to use your GPS, the selection of a model will come easily and you will pay for only those features that you really want. As with all computers today, technology becomes obsolete in a hurry, so if you’re going to sink some serious cash into a unit, make sure you ask about future upgrades and the ability to add on software before you buy. If this is going to be a long-term investment for you, get the most powerful model you can afford and take good care of it. Making the best use of screen views will depend on what you’re doing at the time. Most current models have a plotter screen, which gives you an icon representing your current location, and a temporary record of your "trail". This trail represents your path of travel and it is shown as a series of dots or "pixels" all strung together on your screen. When you choose a waypoint location, another line appears on your screen representing the course you must travel in order to arrive at your location. The plotter screen is my favorite when I’m fishing, because I can use it to follow my own trail when I want to go back to cover a stretch of water that I just fished. In another case I can use the trail to avoid covering the same water over again. Let’s say I caught several Walleyes by fishing along a particular drop off. I would want to follow this trail again to see if there are more fish. But if we just finished casting for Pike along a weed edge on a flat, this time I might want to avoid following my trail to be sure that I don’t re-fish the dead water. Another great feature of using the plotter screen is that it shows your boats position relative to your waypoint or marker icon. By doing this, the need to use a floating marker buoy has nearly been eliminated. This feature can be really useful when you don’t want to attract a crowd during high traffic times or when you don’t have a floating buoy with you. The plotter screen allows me to move from one waypoint or marker icon to another without the need to enter waypoints into the navigation menu. I just follow the path to and from spots that are in visible range on the screen. The "Update Rate" of your trail can be adjusted and will affect the accuracy and also the usefulness of your plotter under varying circumstances. Learn how to set your plotter trail update rate and make adjustments when you need them. When you select a faster update rate, your plotter will become more accurate because your screen shows more detail. But at certain other times, like when I travel long distances on unfamiliar water, I get concerned about finding my way back and I want to be sure to avoid known hazards. This is when I want to set my plotter trail to a longer update time, this will conserve memory and make it possible to save much longer trails. Make a point of learning this portion of your manual to learn how to save trails and you will be able to come back home along the same path you followed going out. Make a point of creating and naming these trails and use the term "safe" in the name. This can be especially useful if you need to come home after dark and happen to be on a lake with rocks or other hazards. Your insurance agent will really like knowing that you use this feature. Even though the plotter screen can lead you anywhere you want to go, it’s often nice to combine the plotter information with other important navigational data. The traditional "steering screens" on many models have an arrow or pointer that shows your heading, ground speed, waypoints and current position in digital form. You can even display a compass dial that helps you stay abreast of your location in a more traditional format. If your GPS allows the use of "multiple screens" or has a window option that combines a plotter screen with a navigation screen, I’d suggest learning how to use a variety of these screen set-ups; this information will help you to become a better navigator. Take the time to learn these screen set-ups while you are on "safe water" and then you’ll be ready to put them to use when you get into un-familiar territory. While we’re on the subject, the ground speed information that you get from your GPS is highly accurate and is second only to using radar for measuring speed. No matter how accurate or reliable your unit is, always have a compass in your boat and always have a mental note of the direction to get back home. I keep a small, but accurate compass glued to the top of my main tackle box. How and where we save our waypoints is really important when we want to go back and use them again. Over the years I’ve learned that it’s better to save fishing spots by going to the center, or "up on top" of a structure. If I save a waypoint along the edge of a drop off or out on the tip of a point, I can miss my spot by steering just a little to far to the left or to the right of my waypoint location. By locating the waypoint further in to the structure, I will steer the boat directly to it every time. This is especially useful when you want to go back to these spots during the ice-fishing season, when everything will look different. Once I have a solid waypoint location, I can steer back out to the edge and add additional markers called "Icons" to help me track the fishing structures. Icons are similar to waypoints in the way you see them on the screen, but the Icons generally can’t be recalled or selected as quickly as the waypoints for navigation. If you want to navigate to an "Icon Marker", you will need to first steer to the main waypoint and then fine-tune your position using the Icon. On most of the GPS models that have mapping features, there is a cursor that can be positioned over the Icon on your screen. Now you can use the menu to find and select the command that will allow you to "Navigate to Cursor Position". On mapping models, these cursors can also be used to select and navigate to a position anywhere on the map. This is useful whenever you have a rough idea of where you want to go, but don't have a waypoint saved or listed in advance. Once you get to the area, you can locate and fine tune your fishing spot and save it to your waypoint list in the usual way. The method you use to save your waypoint can be important too. Most of the time, hitting the "quick save button" will be good enough. But occasionally, you’ll want to keep track of a spot or navigation hazard by using the waypoint-averaging feature. Using waypoint averaging will greatly increase the accuracy of your saved waypoint and makes it possible to find your way back to a small spot like a Crappie crib, rocks or small weed bed. Using this method, you must hold the boat in an exact location for several minutes while your unit marks many points (sometimes several hundred) on the screen and then averages them to calculate a precise location at the center of all the points taken. There are units on the market that can calculate locations to within inches when using this method. In your waypoint menu, look for the command similar to "Use Average Position" or "Waypoint Average". Once you select this option, your GPS will begin keeping track of the number of points taken. You can wait as long as you like before saving the waypoint. The rule of thumb is that the more points taken, the more accurate your position will be. Selecting names and managing your waypoint list is just as important as locating the spots in the first place. I learned my lesson the hard way several years ago, when I had one of my units crash and I lost all of my spots. Luckily, I had a written list as a back up, but the waypoints were all saved as numbers and I soon learned that a list of numbers is really confusing. It was hard to remember why I saved many of those spots. Over the next couple of years, I got it all sorted out, but I learned that it’s important to take the time to give your spot a meaningful, easy to remember name as soon as you save it. Over time, even the casual angler can accumulate hundreds of spots. When you name the spots based on something memorable about your trip, you will greatly increase the odds of remembering that spot and the details that led you to save it. Be careful not to mix up your waypoint list. 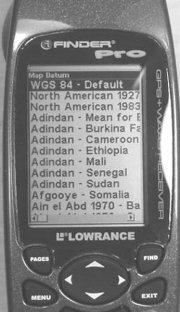 Some of the GPS units have trouble managing a list that contains some spots numbered while others named. If you name them, name them all. If you number them, number them all. This makes it easier for your GPS to access and manage the data on your list. Your unit will run efficiently and therefore save lots of time on the water. Managing your list is getting easier all of the time. In fact, my Lowrance X-15 allows me to save all of my waypoints, icons, maps and even sonar information on a small, but powerful memory card. Now I can use this memory card to download my information to my home computer, move it to another compatible GPS unit or just save it as a back up. I can even put the memory card into my new I-Finder Pro handheld GPS and have all of my summer locations and mapping data available on the portable handheld unit for ice fishing in the winter. If you’re still using an older hand held that won’t allow you to interface with your computer or accept these memory cards, I highly recommend upgrading. For a couple of hundred dollars, you can get a handheld that has more features and power than many of the larger, fixed mount units had even just a couple of years ago. Learning how to use the interface with your home computer varies between brands. But thanks to improving software and detailed "help menus"; it’s getting easier every day. Take it step by step and you’ll run it like a pro in no time. Using GPS maps and after market mapping software will help you get more out of your GPS too. Over the years, I’ve heard several times from folks who complained that they bought a GPS map and thought the map they bought was "wrong". In a lot of these cases, it was because the user didn’t know about selecting the Map Datum information and how to get their GPS to match their map. 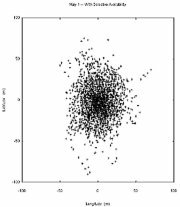 This is simple to do, but it’s critical to getting your data to match the map accurately. The term "Datum" refers to specific sets of adjustments that are necessary to compensate for the irregular surfaces and shape of the earth. Using these Data adjustments enable the creator of a map to make it more accurate when used within a specific area. Most of the consumer GPS units are "pre set" to be compatible, but you will eventually run in to a certain map that was created using a Datum other than the one to which your unit has been pre-set. This will happen often when you switch from a fishing map to a hunting or Geological Survey Map. If you have a map that was created using a certain Datum, but your GPS is set to a different Datum, your selections won’t quite match up and the error will prevent you from finding your spots. To make the adjustment, look at your map and find the Datum information. It will be written in the fine print somewhere and will identify the proper setting to use on your unit. Most common settings in our area are "WGS 84"(often used as the default setting), "North America 1927" or "North America 1983", but there are many others. Once you locate this information on your map, use the menu on your GPS to locate and choose the Datum information. Here you will find a long list of Datum options. Select the one that matches with your map and you’re in business. The screen above shows the list of menu choices that lead you to the Datum selection option. Use this option to adjust your GPS unit to the Map Datum used to create the specific map you are using at the time. Normal factory default settings do not always match maps that you purchase. This adjustment is needed if you want your settings to be accurate. Be sure you always return to the original settings when you switch back to the original waypoint list that you created. In addition to paper maps, there are several after-market mapping programs that you can load directly on to your unit. These programs are available through marine dealers in the form of kits that include all of the necessary connections and software that allow you to connect to your home computer. For some units, the maps are even available as a small memory card that is inserted directly into a slot on your unit. The features vary from one brand to another, but if you like lots of detail, you can get everything from depth contours to hotels and gas stations. The sky is the limit with this technology. We’ve only scratched the surface of what you can learn to do with your GPS. But if you take the time to follow some of these suggestions, read your manuals and learn about your unit’s features. You will amaze yourself at how much more you can do with your GPS. Always remember that you can learn a lot by just pushing the menu buttons and following instructions. Almost all of today’s GPS Units have incredibly helpful menus and they will warn you if you are about to make any permanent changes. If you’re in doubt, just hit the exit button and start over. GPS and fishing ethics. Thanks to this wonderful technology, we are now more accurate and efficient in our fishing than ever before. The day has arrived when the fish literally, have no place to hide from us. This puts a lot of responsibility on our shoulders. Anglers are a proud bunch and most of us share the common desire to do well. Many of us seek some fish to eat, as well as for sport. Couple that with an ever-increasing base of knowledge and fishing experience and it’s easy to see how important it is that we don’t become our own worst nightmare. I believe that over-fishing our favorite spots, sharing too much information or using information un-wisely is disrespectful to the resource and to our fellow anglers. Practicing selective harvest, catch & release and getting involved with community efforts to improve the quality of our fishing experiences; These are crucial ways we can work together to make our children and grandchildren proud of how we improved and preserved fishing for them and their families in the future. Do what you can to leave it better than you found it.